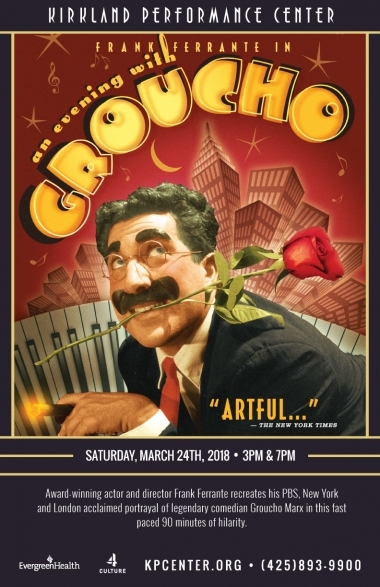 Award-winning actor and director Frank Ferrante recreates his PBS, New York and London acclaimed portrayal of legendary comedian Groucho Marx in this fast paced 90 minutes of hilarity. The two-act comedy consists of the best Groucho one-liners, anecdotes and songs including “Hooray for Captain Spalding,” and “Lydia, the Tattooed Lady.” The audience literally becomes part of the show as Ferrante ad-libs his way throughout the performance in grand Groucho style. Accompanied by his onstage pianist, Ferrante portrays the young Groucho of stage and film and reacquaints us with the likes of brothers Harpo, Chico, Zeppo and Gummo, Charlie Chaplin, W.C. Fields, Marx foil, Margaret Dumont and MGM’s Louis B. Mayer. A show perfect for all ages! Frank played the Groucho role in the off-Broadway revival of The Cocoanuts and has played Captain Spalding in several productions of Animal Crackers winning a Connecticut Critics Circle Award for his portrayal at Goodspeed Opera House and a Helen Hayes nomination in Washington D.C. at Arena Stage. In Boston, he played the Huntington Theatre in the record-breaking run of Animal Crackers that landed Frank on the cover of American Theatre magazine. Frank has now performed the Groucho role over 2500 times in more than 400 cities. His other regional roles include Max Prince in Neil Simon’s Laughter on the 23rd Floor at Philadelphia’s Walnut Street Theatre (which Frank also directed); George S. Kaufman in By George (a one-man play written by Frank); Oscar in The Odd Couple and leads in The Sunshine Boys, Lady in the Dark and Anything Goes. Frank directed M*A*S*H star Jamie Farr in the Kaufman & Hart comedy George Washington Slept Here and revivals of Simon’s Brighton Beach Memoirs, Biloxi Blues, Broadway Bound and Lost in Yonkers.